Alt Thai News Network ATNN : Bangkok Blast: Confronting the West's "Pundit Investigation"
Bangkok Blast: Confronting the West's "Pundit Investigation"
August 22, 2105 (Tony Cartalucci - ATN) - The investigation continues into a powerful bomb that tore through downtown Bangkok Monday, killing 20 and injuring over 100 more. The attack was timed as the current government reshuffled top positions, the new national charter prepared to move forward, and ousted prime minister Thaksin Shinawatra faced the loss of his police rank. The investigation faces many technical challenges but as the government, police, and military attempt to carry it out, the Western media has attempted to "take over" and begin its own investigation, carried out by unqualified pundits and subjected to public opinion rather than actual fact. The objective of the Western media is not truth, but rather to undermine the current government while attempting to exonerate Thaksin Shinawatra - leader of an ousted client regime groomed by and in the service of Western interests since as early as the 1990's. To confront this intentional, politically motivated manipulation, it may be useful to examine several key questions facing any investigation and answer them with what real evidence now stands. Shinawatra who held office from 2001-2006 and who ruled by proxy through successive regimes including one headed by his brother-in-law and the most recent by his own sister, attempted throughout his grip on power to divide and destroy the country. He systematically consolidated and transformed the police into his own paramilitary organization, augmented by a violent street movement known as the "red shirts." Image: Thaksin Shinawatra's militants killing soldiers and bystanders on April 10, 2010. Mass murder and destruction is a hallmark of Shinawatra's political followers. Together over the years they have killed over 130, injured thousands, and destroyed billions in property. 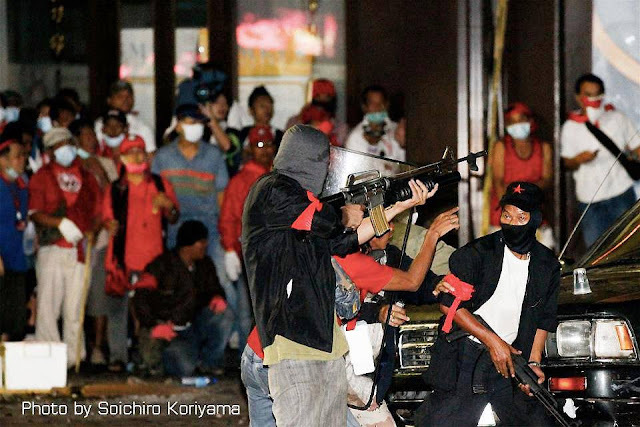 These well-armed fronts have been involved in the worst violence in recent Thai history particularly in large-scale violence in 2009, 2010, and again in 2013-2014 claiming nearly 130 lives in total, injuring thousands more, and resulting in billions in damage, including in 2010 when Shinawatra oversaw city-wide arson. Since the military coup, there had been peace - enduring peace - as Shinawatra's political and militant networks were uprooted and the prospect of paid mobs and large numbers of armed terrorists rampaging in the streets were all but eliminated by nationwide sweeps. Only occasionally, through terrorist attacks, has that peace been shattered. A February 2015 double pipe-bombing featuring a device similar to that used in the most recent bombing was seen as a warning of greater carnage to come. Other incidents included grenade attacks on Thailand's court buildings, traced back to Shinawatra's own cousin. Shinawatra clearly possesses a network of armed militants - however degraded - still capable of carrying out terrorist attacks. 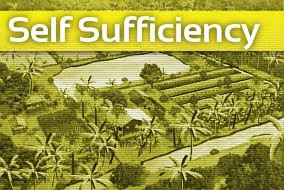 The motive is clear - to shatter the peace and stability the Thai people have asked for and the military has promised. Monday's attack also included an economic component, striking a location frequented mainly by tourists - and in particular Asian tourists - who comprise by far the largest demographic group visiting the country. If Thais are not convinced to ditch the current government regarding security fears, it might be hoped they do so over economic fears. Terrorists sought to undermine not only the peace, stability, and prosperity of Thailand but - like the Western media is also attempting to do - sought to undermine the credibility of the Thai government itself. Shinawatra and his foreign sponsors face a Thailand moving on without him, eager to endure military leadership in exchange for peace and stability while reforms ensure the end of violent political conflict. Elections were first announced for 2015, then pushed back to 2016, and more recently, moved to 2017 - effectively postponing them indefinitely until reforms can be completed. This left Shinawatra with no prospect of returning to power. It was this fact, the charter moving steadily along, and a number of punitive measures being leveled against Shinawatra and his family, that set the stage for Monday's bombing. Beyond the fact that Shinawatra has carried out extensive violence against Thailand in the past, including armed insurrection and mass arson, it should be noted that a number of bombings have also taken place - some incidents involving devices nearly identical to those used in Monday's bombing and the pier bombing the following day. At least one of these previous attacks involved methods identical to that used on Monday. 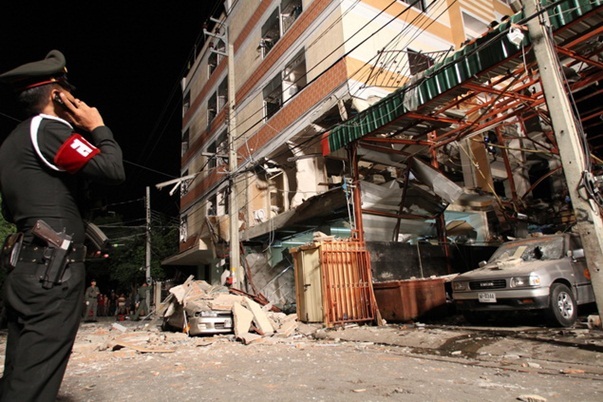 Image; A deadly blast in Nonthaburi in 2010 killed several of Thaksin Shinawatra's red shirts. They were apparently assembling bombs in a room full of explosives and other weapons when one of the devices accidentally exploded. In 2010 in Nonthaburi a powerful bomb accidentally exploded killing a room full of Thaksin Shinawatra's "red shirts." Weapons and ammunition were also found in the room during the investigation - weapons similar to stockpiles discovered around the country during nationwide sweeps in the wake of the 2014 coup. In 2014 in Min Buri - connected to the Nonthaburi bomb-ring - another bomb accidentally exploded, killing two red shirt would-be bombers while riding a motorcycle. The explosive devices discovered in Min Buri were very similar to those in Nonthaburi, and would resemble other devices to be used in the near future. 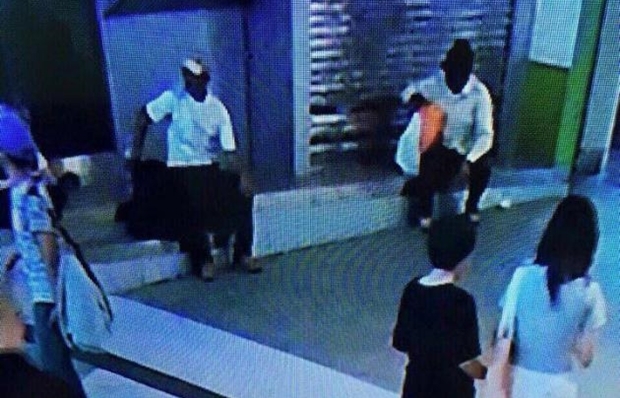 In early February 2015 a double pipe bombing was carried out in downtown Bangkok - just down the road from the recent bombing - near the Siam Paragon shopping complex. 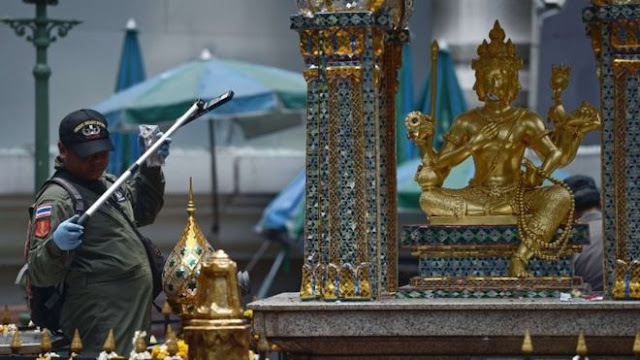 According to Thai PBS, the devices used were described as pipe bombs 10 centimeters in diameter, and 20 centimeters in length, containing explosives and 2-3 inch nails. The device, similar to those found in both Min Buri and Nonthaburi linked all three incidents together. It was delivered by two suspects who dropped off bags at the bomb site similar to how Monday's bombing was carried out. The most recent bombings - a deadly blast on Monday and a following blast on Tuesday which claimed no casualties - were carried out with devices almost identical to those used in Nonthaburi, Min Buri, and Siam. A reconstruction of the device used in the second attack resembles almost exactly that recovered in Min Buri. Image: (Left) Thailand's Explosive Ordnance Disposal (EOD) reconstructed the device used in a follow-up bombing Tuesday this week. 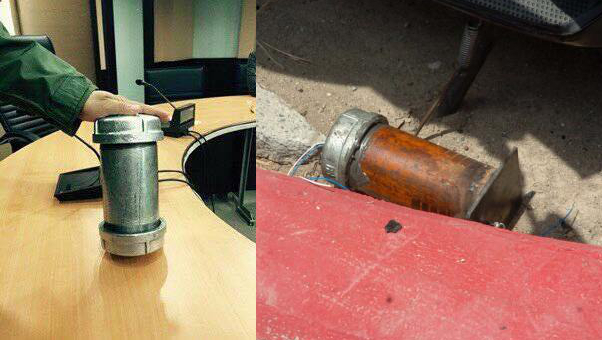 (Right) A device recovered in 2014 when red shirt bombers accidentally killed themselves in Min Buri. Judging from the current evidence, it is likely that Monday's bombing and the followup blast the next day were simply the next logical step of a terrorist ring operating in Thailand on behalf of Thaksin Shinawatra and likely with accomplices tied to Shinawatra's police allies. Image: In February this year, two suspects sat , put their bags - each with a bomb inside - in place, then left before both devices detonate. No one was killed in the blasts - but this very method using a similar device would again be deployed last Monday, killing 20 and injuring over 100. The double bombing was considered a "warning" by many of the very carnage seen on Monday. Beyond merely matching bombs, there is also a considerable amount of threats that have been made by Shinawatra's militant front - including calls for outright "civil war" and acts of extreme violence. It would be the London Telegraph that would report in an article titled, "Thai red shirts leader says 'It's time to get rid of the elite',"
"This is already a war, but so far it is an unarmed war," said Ko Tee. "If there is a coup, or the election doesn't happen, then it definitely becomes an armed war." If anyone doubted the abyss into which Thailand could be heading, Ko Tee - who has been accused of orchestrating grenade attacks on anti-government marches in the thai capital - is the living proof. "I want there to be lots of violence to put an end to all this," he said. "I'm bored by speeches. It's time to clean the country, to get rid of the elite, all of them." "If there is a coup, of course I'll go to Bangkok and fight," said Phutthiphong Khamhaengphon, the head of security for Khon Kaen's red shirts. "Millions of us will go. We'll fight in many different ways. If necessary, it will be like the Vietcong fighting the Americans in Vietnam: a guerrilla war." In reality, such a conflict is not possible. Shinawatra does not, nor did he ever have, the support or the operational capacity to lead such a war. However, wide scale terrorism dressed up by a complicit Western media was not only a very real possibility, it was the only possibility left for Shinawatra and his foreign backers. Establishing means, motive, opportunity, and even citing threats, and matching methods of criminality does not close the case alone. Investigators must continue their work, and above all, avoid the provocations of those who attempt to undermine their efforts and credibility. With the Western media attempting - just as the bombers themselves did - to undermine the current Thai government, the truth is slowly being buried under a mountain of lies, spin, and intentional misdirection. The Western media is attempting to sow enough mistrust and confusion that no matter how conclusive Thailand's final investigation is, the West will be able to claim "reasonable doubt." However, looking at the above evidence, as it stands, it is difficult to imagine Shinawatra was not involved. He had the means, the motive, an opportunity, and a history of violence including the use of bombs almost identical to the ones used in the most recent attacks. His violent political and militant fronts have openly threatened to carry out large scale violence. And now that violence has been realized. It is up to the Thai government to close this case officially - but for the Western media - to be confronted by these facts and to sidestep them, proves that catching the bombers may be only the first step in truly confronting and defeating Thailand's enemies.